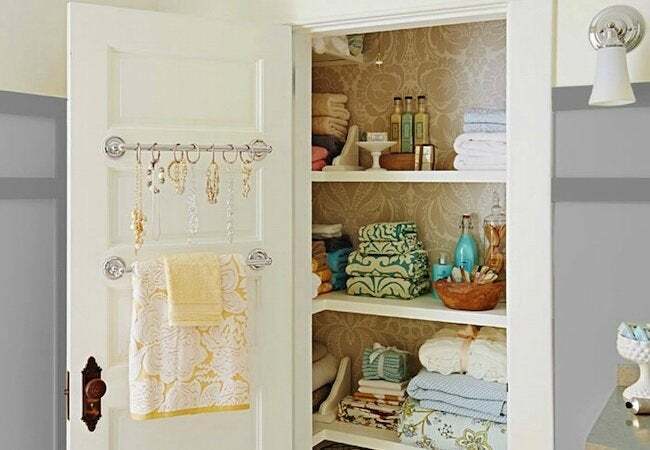 Free up space, amp up style, and reclaim your sanity with 21 clever ideas for making small closets big! There’s never enough storage. Whether they live in a tiny cottage or a sprawling estate, homeowners always seem to complain about the closets—their disappointing scarcity and frustratingly small size. Basically, we’re all engaged in an endless battle to fit ever more stuff into little space. Ready to give up the struggle? Get rid of those belongings that you don’t really need, or sign on the dotted line for storage-unit lease. Hey, there’s no shame in it. But if you’re not ready to surrender yet—if you’ve still got a little fight left in you—take heart. 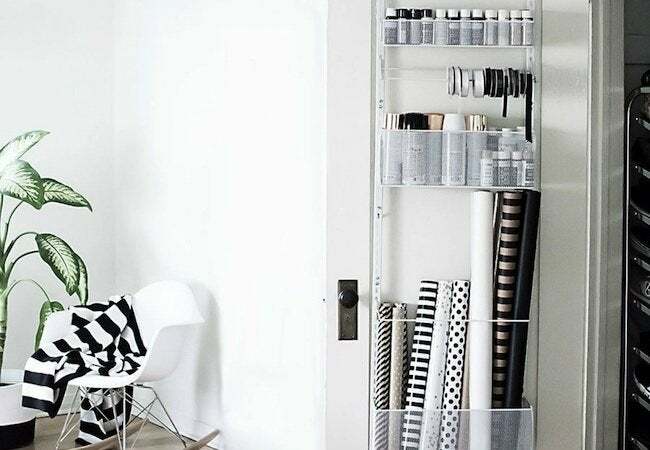 Plenty of people before you have faced closet conundrums and won, sometimes by using clever DIY hacks, other times by making savvy purchases, but always by making the most of every single square inch. For the best small closet ideas, from veteran design experts and the space-savviest average Joes, continue now! Empty soda cans may take up space in the recycling bin, but in a cramped closet, they create more. How? 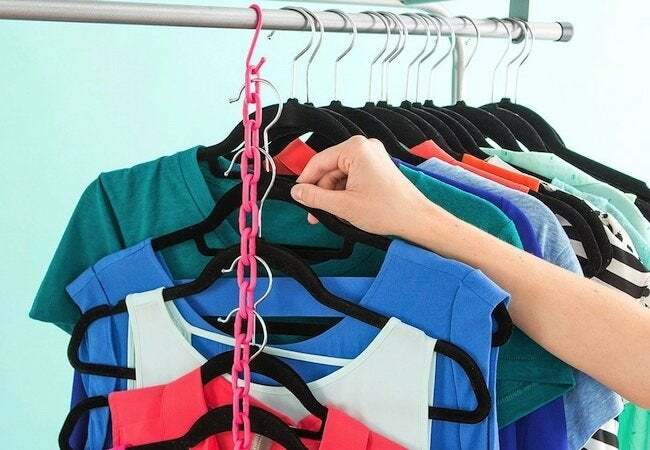 By doubling the number of garments you can hang on one hanger. Simply pop the tab off the can and slip it around the hook of a hanger. You can then slip another hanger through the hole in the tab. Easy, effective and best of all, free. 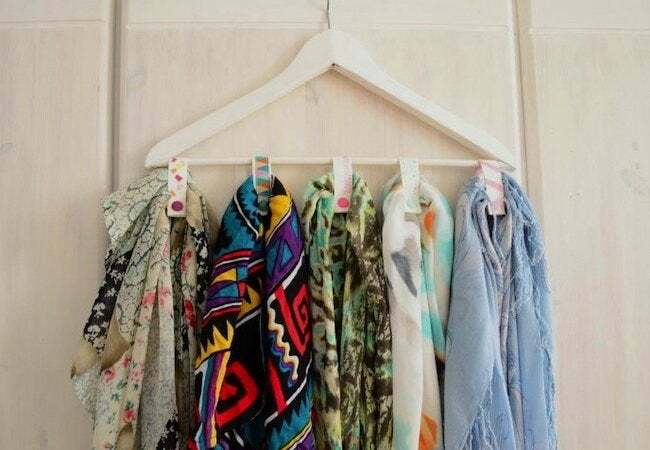 This homemade hanger hack may be the missing ‘link’ between you and a clutter-free closet. Here’s what to do: Spray-paint a foot-long plastic chain in any color you like, then attach the last link to a large S-hook. Fit the S-hook over the closet rod and finally—the coup de grace!—slip hangers hooks through each link in the chain. Smart, right? If heaps of wrinkled clothes have turned the floor of your closet into a second hamper, don’t fret. You can restore order by installing track shelves. 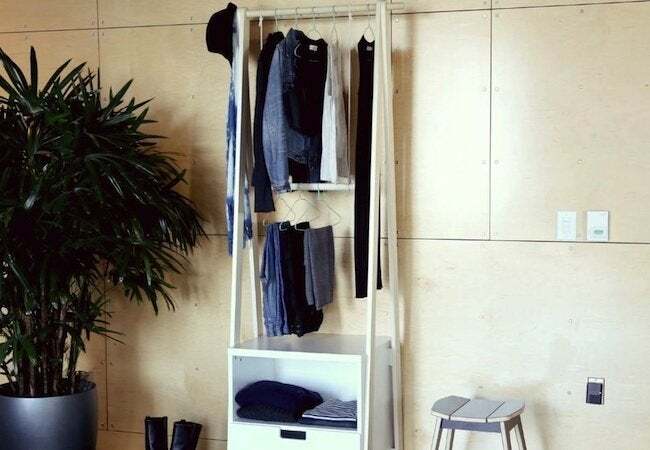 User-friendly and endlessly customizable, track shelving enable you to make the most of the vertical space—that’s the real key to making a small closet work harder for you at home. Are there homeless hats, scarves, and belts hanging over the backs of chairs throughout your house? Stop the madness! There’s a better way: Create an off-the-wall organizer to serve as the designated, permanent home for accessories. Your solution doesn’t need to be fancy. Look at this one: It’s nothing more than a hanger on a nail, embellished with homemade hooks. Take your most frequently worn items out of the closet and store them out in the open, in a freestanding organizer like this one. Watching your spending? Don’t shop for one; make your own instead. There are options aplenty. You can even get creative. The clothes rack picture came together entirely with repurposed materials, including an old office cabinet. 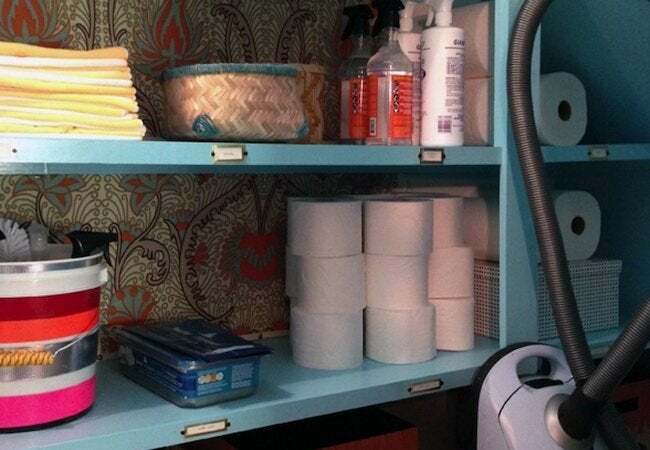 This surprisingly sleek solution works to wrangle craft supplies discreetly behind a linen closet door. 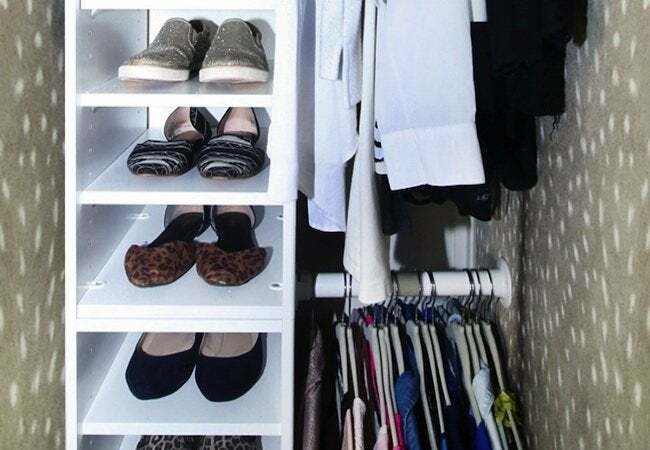 But you can apply the same principle to any small closet, in any room. 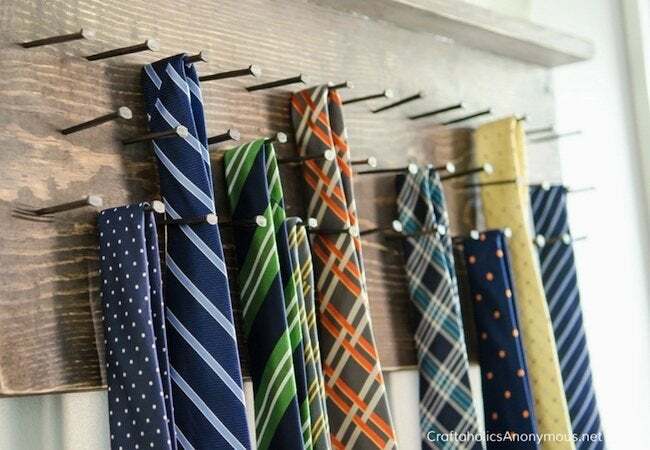 A bare-bones wardrobe assistant like this one provides the perfect perch for neckties and similar items. Mount yours to a side wall in the closet, to the back of the closet door, or even in your bedroom dressing area. Making one involves nothing more than driving a series of nails into the surface of a painted-or-stained piece of scrap wood. In a space-challenged closet, forgo a single, inefficient tension rod in favor of this double-duty DIY organizer. 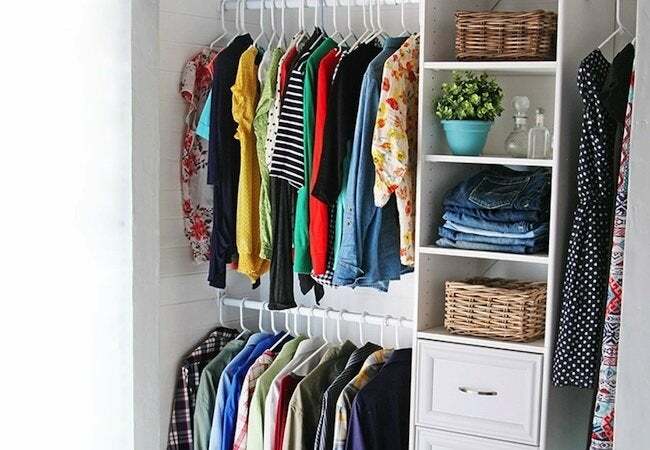 By reserving half the closet for a skinny shelf and the other half for two short rods, you’ll create ample room for garments that hang as well as space for shoes and folded clothing, while minimizing visual clutter. It’s never too early to teach your little ones how to get organized. Easier said than done perhaps, but this simple idea certainly helps get the message across. What’s involved? 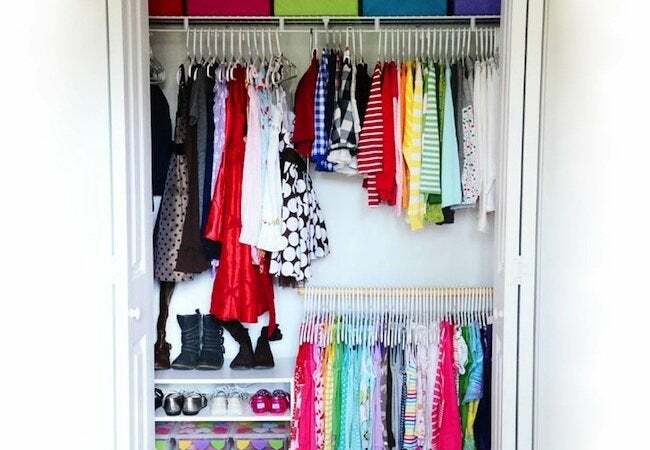 Simply install a companion closet rod at a child-friendly height, both to let kids hang up their own clothes and also to give the closet a handy additional rung of hanging space. Many homeowners who purchase a custom closet solution end up believing it was money well spent. Hiring professionals isn’t your only option, though. If you have the tools and experience, why not design and build your own? In fact, even for novice woodworkers, building out closet shelving and cubbies often makes for a satisfying project. Need a place to put bath linens? 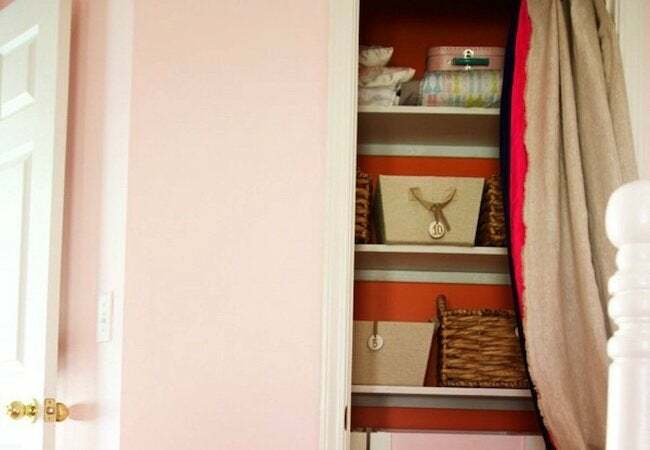 Try mounting multiple towel bars inside the door to the nearest closet. You can even add curtain rings to the towel rods if you need to store, not towels and wash cloths, but small, loose items like jewelry. Escape clutter and invite rustic charm into your bedroom by eschewing a traditional out-swinging door in favor of one that slides back and forth. 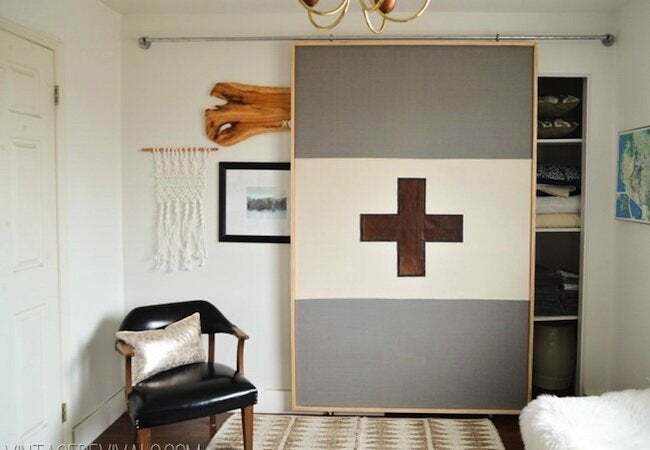 Barn doors are nothing new, of course, and there are many possible approaches, but one thing’s certain—there’s no better fix if your problem amounts to not being easily able to reach items toward the back or along the side of your closet. 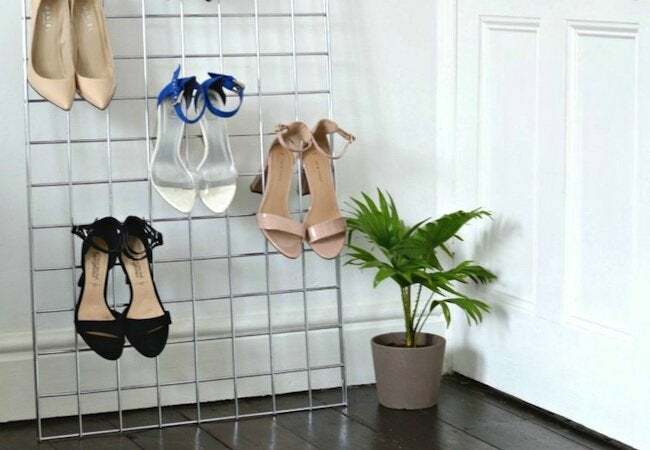 Put your enviable shoe collection on display—and put a boring wall to work—with this easy little do-it-yourself trick. Negative space becomes elegant, economical storage. 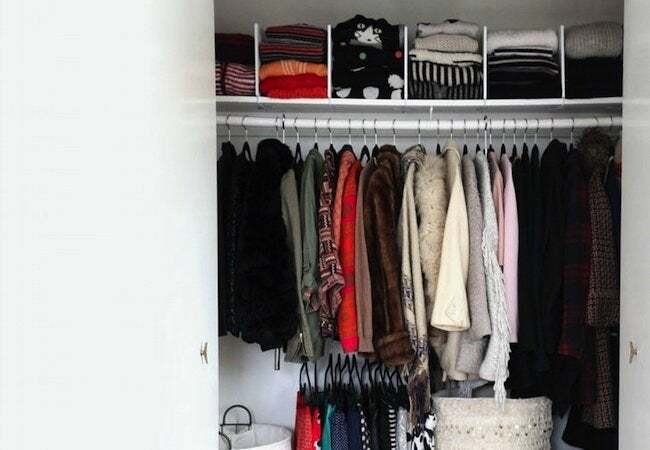 Successfully cramming more and more into a small closet isn’t the be all and end all. After all, to be truly satisfied with a closet, you need it to hold what you want, but you also need to be able to find what you need. Want to go the extra mile? Label shelves and cubbies to help make sure there’s a place for everything, and that everything stays in its place as time goes by. 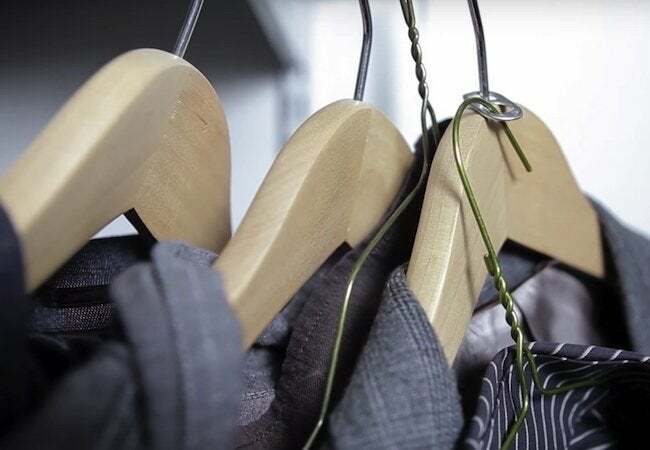 Why is it so hard to keep clothes neatly folded on closet shelves? We may never know. But in the meantime, here’s a great way to reinstate order: set dividers at regular intervals along the full length of each shelf. That way, folded shirts, pants, and sweaters don’t revert to formless mounds of fabric that are a pain to sort and sift through. The biggest barrier between you and an functional, organized room may not be the cluttered contents of the closet, but the closet door itself. Consider removing and replacing the door with a floor-length curtain to add space and an element of luxury to a bedroom or guest room. Bins and baskets are go-to storage solutions for a small closet, but if they’re not properly marked, finding the item you want can be like looking for a needle in a haystack. 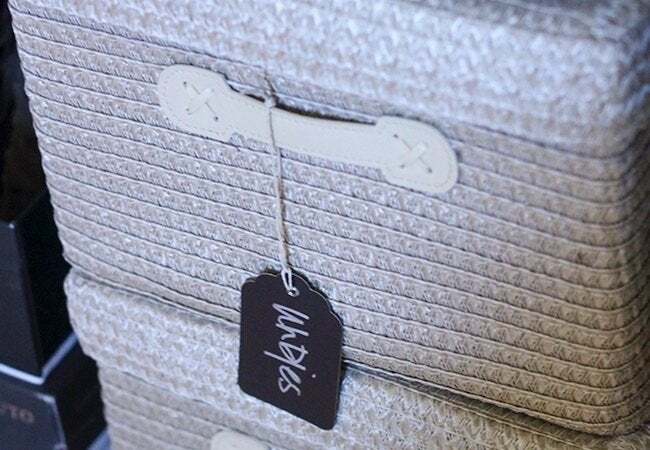 Before stashing closed storage bins in a closet, be sure to attach plain or decorative labels to them for easy retrieval. 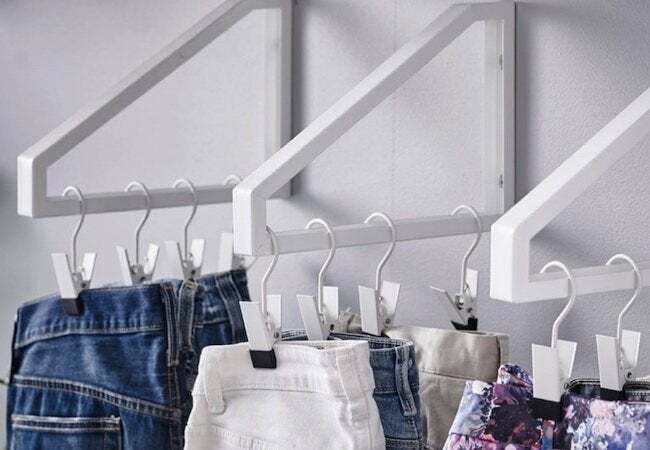 When space is at a premium, consider this space-saving storage idea as an alternative to installing a second rod in a closet. Mount painted shelf brackets to the sides or back of a closet to hang wardrobe essentials efficiently and in a way that wards off wrinkles. 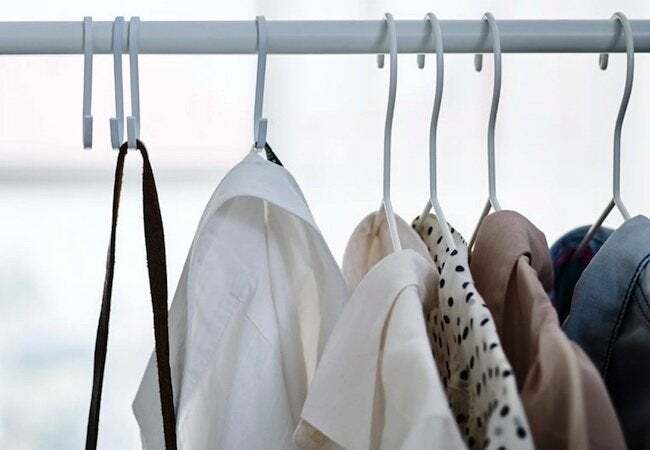 For certain items, S-hooks are your best bet, and that’s especially true in closet corners too cramped to accommodate the fuller width of a traditional hanger. Here, S-hooks hang alongside wire hangers to keep purses, belts, and hats suspended within easy arm’s reach. 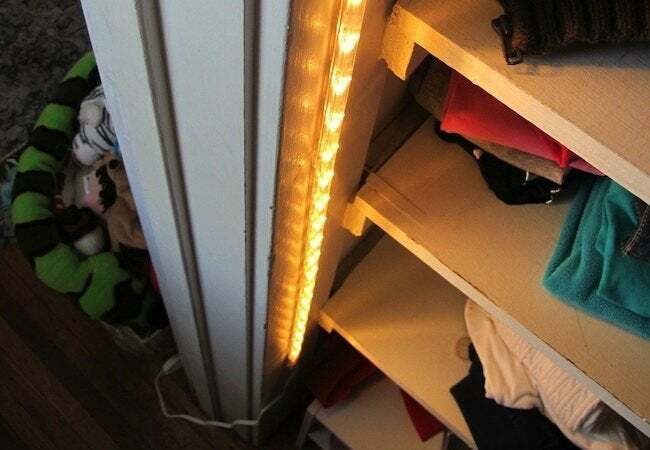 Is lack of light only making living with your small closet more difficult? There’s more than one way to improve the situation, but LED strips rank as one of the simplest, lowest-cost available options. Plug-in strips don’t require professional installation—far from it!—and LED bulbs last for years and years without ever needing replacement.